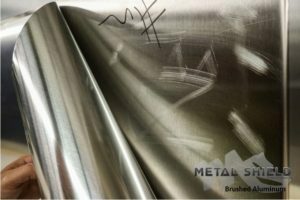 Metal Shield is a thick Anti-Graffiti abatement and obscuring film to be applied on existing metal surfaces to replicate the original surface appearance. It is available in Stainless Steel and Brushed Aluminum finishes. 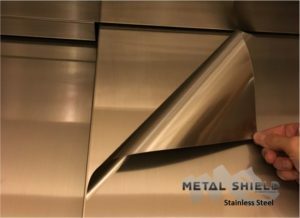 The Metal Shield Stainless Steel is a 6 mil thick film that was designed to look like 304 stainless steel with a #4 brushed appearance. The Metal Shield Brushed Aluminum is a 6.5 mil thick film and has bright brushed aluminum look. These Patent Pending products were initially designed to solve a common problem with Stainless Steel in general public environments. Typically Stainless Steel is the metal of choice to resist corrosion and rusting from the elements as a cladding or building material. However as durable as this metal is, it is easily damaged by anything abrasive including but not limited to sand paper, keys and screwdriver like tools. With that said, a vandal could “tag” their name into a panel of Stainless Steel with minimal effort and cause epic damage. Since Stainless Steel is prefinished at a factory with large format machinery to give it a polished grain appearance, repairing damage by hand in the field is virtually impossible to achieve without having a refinished or repaired look. The solution- Metal Shield. By preparing the Stainless Steel and installing over the damaged surface our thick films replicate the appearance of original Stainless Steel and you are rendered a clean new protected surface. This film is thick enough to protect the substrate from normal damage if it was to be vandalized again and or cover up existing damage while making the surface look new and factory finished. Our Metal Shield utilizes a proprietary adhesive strictly designed to bond strong enough as to not be removed by the general public but easily removed by a trained technician without leaving any adhesive transfer on the metal surface.